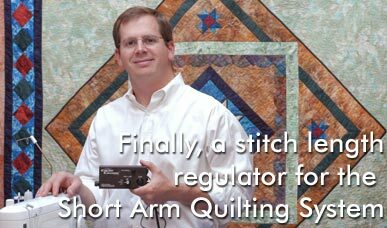 The Quilter’s Cruise Control®, proudly made in the USA, is a stitch length regulator for use with many short-arm quilting frames. It plugs directly into your sewing machine’s foot pedal port. Using optical encoders mounted to your quilting frame, it actively changes the speed of the sewing machine as you move it to help maintain uniform stitch length throughout the quilting project. Interested in learning more about QBOT? Pfaff various older models Proflex Join us for a Consumer Webinar! Quilt Easy visit www.myqbot.com for upcoming Events. *requires compatible parts, purchased from frame manufacturer. 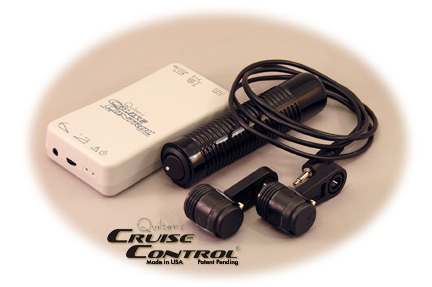 To order QCC accessories and replacement components, please visit our parent company website: www.myqbot.com. Click on "Parts & Accessories"
Copyright 2012 LiTen Up, Inc. All rights reserved.